It’s no secret. The performance of companies can be measured by numbers. Some numbers are more helpful than others in determining this. Tools like the Value Trap Indicator and Altman Z Score formula are geared toward doing just that. Both tools are extremely efficient in avoiding companies that are about to go bankrupt. One of my readers is a stock analyst and interested in the differences between the two. Here’s his question and my answer. I am an analyst and investor based in India. I came across your VTI book and website (yet to purchase the book). While the idea of identifying value traps and differentiating them from value buys is great, what I need to know is whether the VT indicator is a number similar to the Altman Z-score. Indeed, how does your VTI differ from Z-score since the objective is somewhat similar, if not the same. The Value Trap Indicator is indeed a number similar to the Altman Z-score. Both aim to warn against a company that is about to go bankrupt. However, there are a few other features of the Value Trap Indicator that the Z score formula doesn’t have that proves to be very useful to the investor. Let’s examine the Altman Z Score formula first. The Altman Z-score uses 5 business ratios to predict bankruptcy. 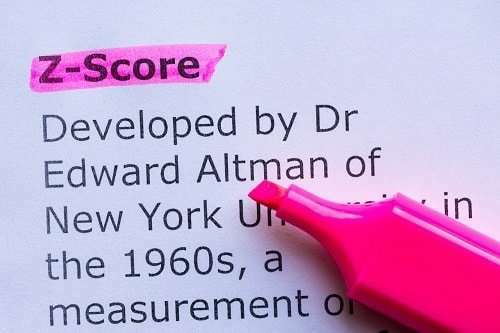 The NYU Stern Finance Professor Edward Altman created the Z score formula out of a data sample of 66 manufacturing firms. Half of those firms had gone bankrupt, while the other half scored well on the formula. Altman’s Z Score formula was later tested and proved to be about 72% accurate in predicting bankruptcy within 2 years. From about 1968 to 1999, the Z score was tested to be somewhere around 80 – 90% accurate in predicting bankruptcy. …Where Retained Earnings can be found in the balance sheet under the “liabilities and shareholder’s equity” section. Within this calculation, a z score of 3.0 or higher means a company is relatively safe from bankruptcy, while a z score of 1.8 or lower means a company is in great danger for bankruptcy. Compare this to the Value Trap Indicator, which uses a combination of 7 categories of financial ratios. A company with a VTI greater than 800 is in great danger of being a value trap and losing much of its share price or heading to bankruptcy. A company with a VTI less than 250 is considered a potential great purchase. Similar to the z score, the Value Trap Indicator was tested on the 30 biggest companies that went bankrupt from 2001 – 2012. From that data set, the VTI was successful in avoiding 29 of the 30, for a 96% success rate. In other words, only 1 company of the 30 scored a VTI less than 250. Of the 30, 22 had a VTI greater than 800. Both the Z score formula and the VTI formula are clearly great tools for investors wanting to avoid stocks headed towards bankruptcy. However, there is a subtle difference in the two formulas. The Value Trap Indicator, as stated above, warns of a company being a value trap.. With some of the cases ending in bankruptcy. Sometimes a stock is just a value trap and not headed to bankruptcy, due to being extremely overvalued with bubble-like characteristics. In either case, the goal is to avoid buying a stock that will likely end in a depreciation of value for the investor. The Value Trap Indicator is able to accomplish this by including a wide variety of stock price based valuations, including: P/B, P/S, P/E, and P/C. The Altman Z Score formula on the other hand includes one stock price based ratio in Market Capitalization, but favors a higher number as assisting in keeping a company from bankruptcy. This could be arguably true or false, but the fact remains that the calculation won’t deter an investor from an extremely overvalued situation. If we get into the nitty gritty behind both calculations, you’ll see that both heavily depend on net earnings and the balance sheet. In particular, a negative net earnings will automatically disqualify a company from being a buy for the Value Trap Indicator. This additionally has an impact of adding 614.298 to the score, almost pushing the stock to the “strong sell” category. Negative net earnings impacts the Altman Z Score greatly as well, adding a negative value to the 1.4 category and 3.3 category. It will most likely be quite hard for a company to overcome that, though a higher total asset count reduces this impact. As you can also see, the Altman formula depends on either total assets or total liabilities on each of the 5 financial calculations. This means the balance sheet heavily influences the final score. The 1.2 category measures the current liquidity as it relates to the overall balance sheet, the 0.6 category covers situations where a company might be over-leveraged, and the 1.0 category measures the efficiency of a company in a similar fashion to return on equity type calculations. For the Value Trap Indicator, the balance sheet is used to evaluate the safety of an investment on a sliding scale. It uses the Debt to Equity ratio, with a higher value adding increasingly more impact the greater than 1 it is. The VTI multiplies the Debt to Equity ratio by 57.144, meaning each unit above 1 adds over 50 to the total. As the Debt to Equity crosses over 5 or 10, the stock no longer becomes a valid buy and easily crosses into “strong sell” territory with a Debt to Equity above 20. In the case of negative shareholder’s equity, resulting in a negative debt to equity ratio and rendering it useless, an addition of 614.298 is automatically added to the score and the stock is already very close to value trap territory. Besides an extraordinarily high valuation in relation to sales, net cash, book value or earnings, these are the biggest potential impacts to the Value Trap Indicator score. While the Altman Z Score Formula stops here as far as major focuses from the financial statements, the Value Trap Indicator takes it a couple steps further in an attempt to gain a complete picture of a company’s financial health. The addition of P/C to the Value Trap Indicator adds an exposure to the cash flow statement that the Altman Z Score Formula doesn’t feature. The cash flow statement is an important tool in helping to understand whether there is a sufficient flow of current capital. A component of growth is covered in the Value Trap Indicator that also isn’t featured in the Altman Z Score. Growth of earnings often drives stock price. In fact, there’s a big portion of stock market analysts and investors who focus solely on growth. The Value Trap Indicator dedicates a whole category to the growth of earnings for a stock. To be more long sighted, the formula looks at average growth over a 3 year period. This separates the steady and consistent growers from those without. The VTI also disqualifies non dividend payers from being a “strong buy” with an addition of 250 to the score. Consider that it isn’t uncommon that a company cuts their dividend as a last ditch effort to avoid bankruptcy. While a non dividend payer isn’t automatically a dangerous situation, my personal investing philosophy confirms that the best and often safest investments come from steady dividend payers. Plus, the dividend cut factor can’t be overlooked. An element of the payout ratio is added to the dividend category, to guard against dividend payers that are paying too much of their earnings as a dividend. This can similarly be mitigated by the retained earnings category of the Altman Z Score. If you want to see a preview of the 7 Value Trap Indicator categories before purchasing the book, look no further than my free 7 Steps the Understanding the Stock Market guide. Those are the same categories that I’ve taught thousands of readers to analyze. So those are some of the discrepancies between the two formulas. I’m not here at all to claim that one is better than the other, and it’s obvious that both are effective. There’s nothing wrong with having many tools in the tool shed, so to say. I say more knowledge is always more power. But be careful about using a tool you don’t completely understand. That’s a quick way to hurt yourself. Equip yourself with many tools, but know when to use each one.